Forage/Pasture: For decades KY-31 Tall Fescue was planted widely as a forage and erosion control plant because it is widely adapted, easy to establish and long lived under harsh conditions and mistreatment. It is now recognized that the presence of a toxic endophyte contributed to both the tough nature of KY31 and the poor performance of grazing animals in the warmer months. It is suspected that endophyte infected KY31 has been deleterious to wildlife as well. Today, there are many varieties of Tall Fescue that are low endophyte or endophyte free, which can be used for hay or pastures without any of the animal health concerns posed by endophyte infected KY31. Tall Fescue testing services are available to have existing stands of this grass evaluated for endophyte presence. Turf: Tall Fescue has excellent wearability, is shade tolerant, drought tolerant and has lower maintenance requirements than other turfgrasses. By using improved turf varieties, a very attractive lawn is attainable. 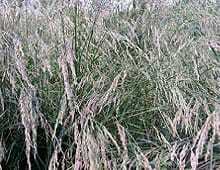 Tall Fescue is a robust long-lived, comparatively deep rooted, bunchgrass. The broad flat leaves are smooth and shiny on the underside, with pronounced ribs on the upper surface. The stems are 3-4 feet tall, supporting a nodding panicle that is 4 to 12 inches long. There are approximately 227,000 seeds/ pound. Tall Fescue is adapted to cool and humid climates and most soils with a pH of 5.5 to 7.0. Tall Fescue will grow fairly well on soils low in fertility, but it is better adapted to fertile conditions. Tall Fescue will produce top growth when soils are as cold as 40°F, and it continues growth into late fall in the south. Tall Fescue is easy to establish due to its rapid germination and good seedling vigor. It may be planted by any common method such as grass seeders, hydroseeding, and broadcasting. For forage or pastures, seeding rates are 15-20 pounds/acre if drilled and 20-25 pounds/acre if broadcast. The seeding depth is 1/2 inch. Turf seeding rates are 7-8 pounds/1000 sq. ft. for new lawns, and 4-5 pounds/1000 sq. ft. for established lawns. While Tall Fescue is tolerant of abuse and low fertility, it does respond to fertilizer inputs. Follow the soil test recommendations for turf and forage uses. Endophyte-infected Tall Fescue will tolerate grazing abuse better than most cool season grasses. If the Tall Fescue is an endophyte-free variety, it should not be grazed closer than 3 inches, and will not tolerate overgrazing. Tall Fescue can be grown with white clover, red clover and alfalfa. First cutting for hay should be at the late boot stage with further cuttings as regrowth allows. Tall Fescue is one of the best grasses for stockpiling in the fall. When used for turf, mowing height should be 2-3”. Mow frequently enough so no more than 1/3 of the total leaf surface area is removed Fertility requirements are low to medium. Disease control measures may be needed depending on conditions during the growing season.